Wild-caught Flounder fillets coated with crunchy breadcrumbs. Extra-large, extra crunch, extra delicious. 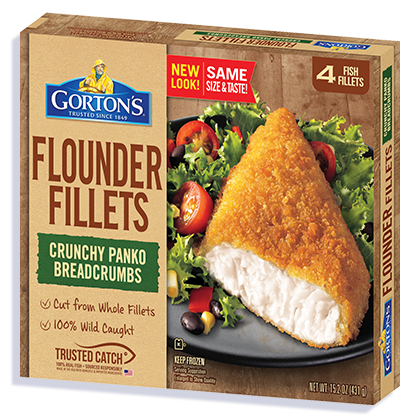 Not only are our Premium Flounder Fish Fillets coated with breadcrumbs made from daily baked bread, they’re also oven-fresh and ready to enjoy in under 25 minutes. 3. Bake 22 - 24 minutes total. * Flip after 12 minutes. INGREDIENTS: Flounder fillets, breadcrumb coating, vegetable oil. Wheat flour, water, yellow corn flour, sugar, salt, whey, baking powder (baking soda, sodium aluminum phosphate, cream of tartar), yeast, maltodextrin, lemon juice solids, citric acid, dehydrated garlic, natural flavor, spices.